The reluctance to understand the working of the investment market can cost the investor dearly. Everyone wants to back a winner but sometimes this can be a malady; especially when such a winning streak is not sustainable. Investors tend to back a stock which is currently strong without examining the reasons for its rise. This will inevitably lead to the stock’s downfall . ‘Those who forget their history are condemned to repeat it’. Learn from mistakes and keep a track of your performances. A rational approach would be to document the market and sector trend, the exit target and the trailing stop. This record is a useful manuscript for identifying barriers and getting around them. Introspection is the right action which the investors need to undertake in order to find out their own behavioral weaknesses. Specifically, examining the past investing pattern will help pin-point the successful as well as the unsuccessful endeavors. What is to be changed is perhaps easier to identify than making the actual change. Bringing about a change in one’s behavioral pattern needs unwavering focus. A half-hearted attempt will not yield the desired result hence a temporary break from the investmentroutine is advisable to regain focus. Coming to terms with losses is a point of maturity in the investor behavior index. 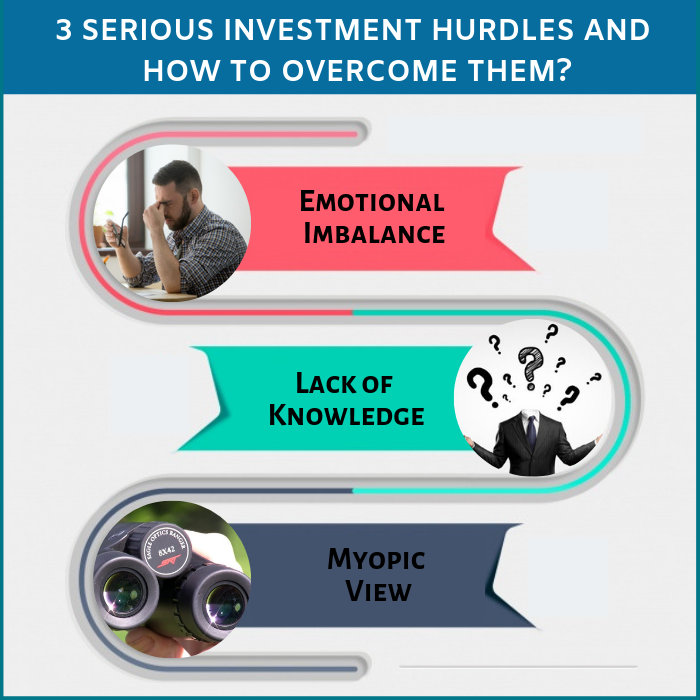 How to cope with losses which are a part and parcel of the process of investment is something which the investor has to learn. Accepting the loss and moving on will augur well for the overall investment process. The data available on different investment strategies are overwhelming and can often become intimidating for the investor. Under such circumstances it is always better to avoid trying to become a ‘jack of all trades’, rather mastering one investment strategy is a useful policy to follow. It may result in the loss of some investment opportunities but will help the investor to gain confidence in the chosen process. Assessing the market, learning the subtle nuances and taking action accordingly will lead to an enhancement of the risk-reward evaluation process. Making a learned judgment based on the probabilities and market behavior will yield positive results. Often investors feel that the market will behave in a manner that they expect it to behave, however more often than not, it is not so and the market behaves on its own terms. Investors will be best served if they stick to an objective approach.